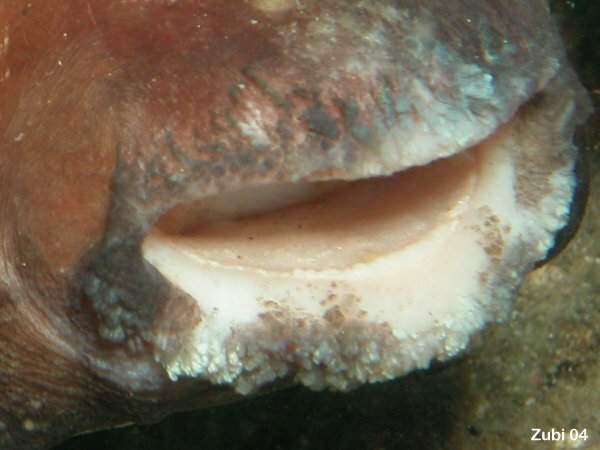 The family of Molidae belongs to the order of Tetraodontiformes (trigger fish, boxfish, porcupine fish, puffers). 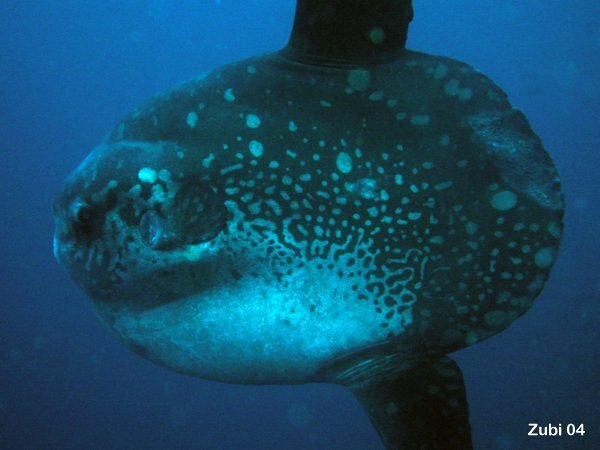 They consists of six species: Mola mola (ocean sunfish), Masturus lanceolatus (Sharptail mola) and Ranzania laevis (Slender sunfish), Mola ramsayi (southern sunfish), Amblypharyngodon atkinsonii and Amblypharyngodon mola. 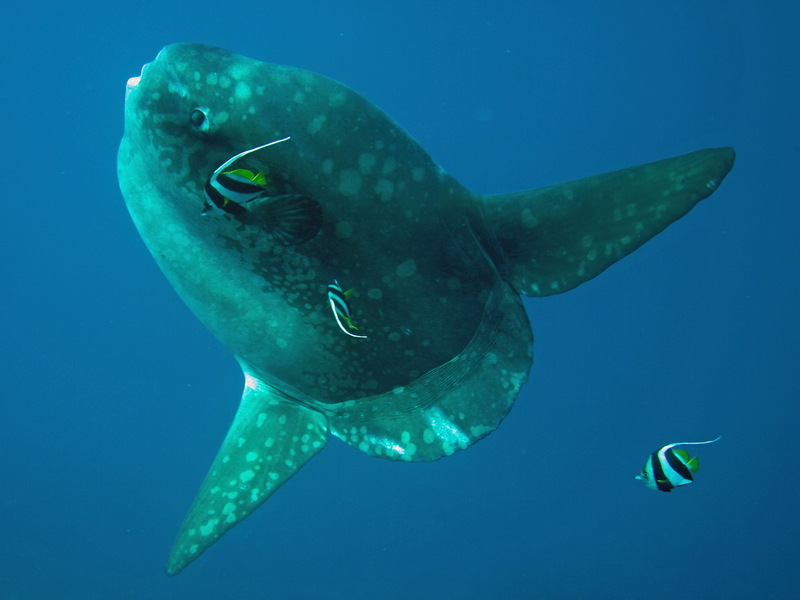 Specially the ocean sunfish (Mola mola) has a very unmistakable look with its eccentric roundish shape with huge fins but nearly no discernable tail. 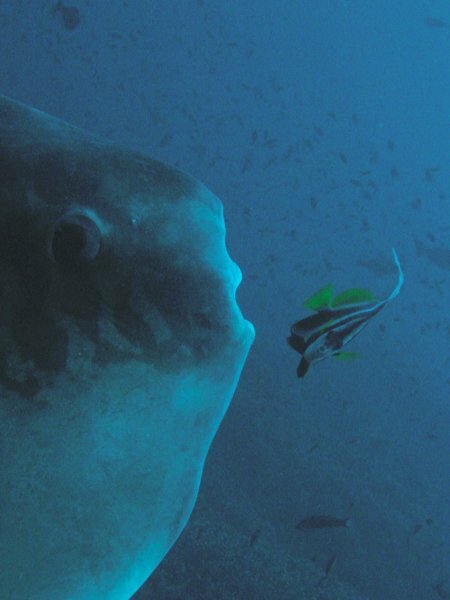 The word "Mola" comes from Latin and means millstone. Sunfishes are found in all oceans in tropical and temperate climes, but prefer open ocean. They are adapted for life as a sluggish, pelagic predators of jellyfish or other larger invertebrates that come close enough to be sucked in. Probably they inhabit the mesopelagic zone down to about 1000 meters, but live most commonly about 300m deep. Molas are considered to be among the most fecund of all vertebrates, producing more that 300 million eggs, each about 2 to 3mm large. The larvae look much more like their close relatives, the puffer or porcupine fishes with needlelike spikes. As they grow their body flattens and the spines and their tails disappear. Molas have a very small mouth that they can't close and they posses a parrot-like beak formed by sharp edged plates of fused teeth. This is also typical of puffer fish. Molas are not highly desirable as food, since their meat may contain the same toxin as puffers and porcupine fish. 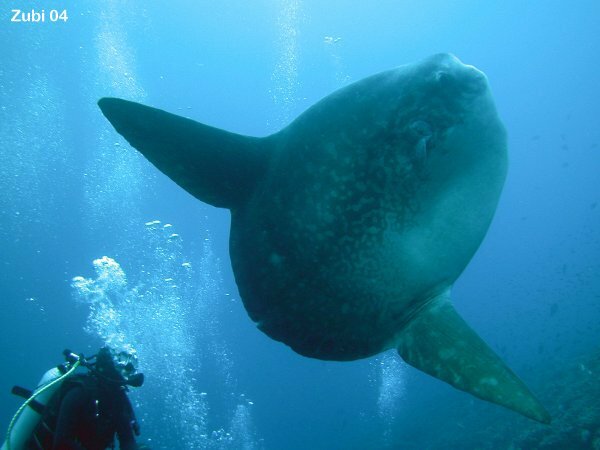 The sunfish can probably get over 100 years old. In southern California the sunfishes surface and seagulls pick these parasites off them. 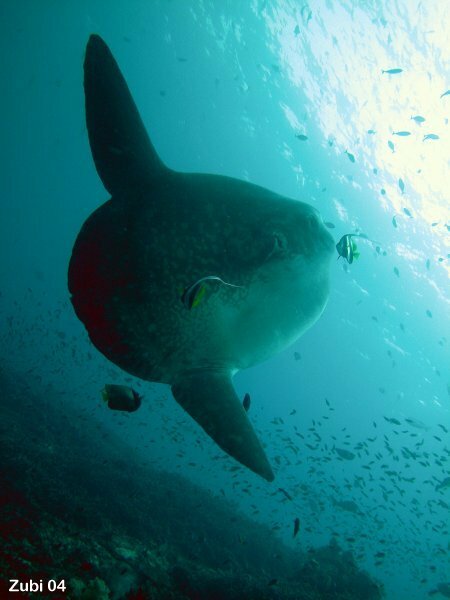 They often drift at the surface while lying on their side, or swim upright and close to the surface that their dorsal fin projects above the water like a large shark fins. Here Molas are also commonly observed jumping out of the water. 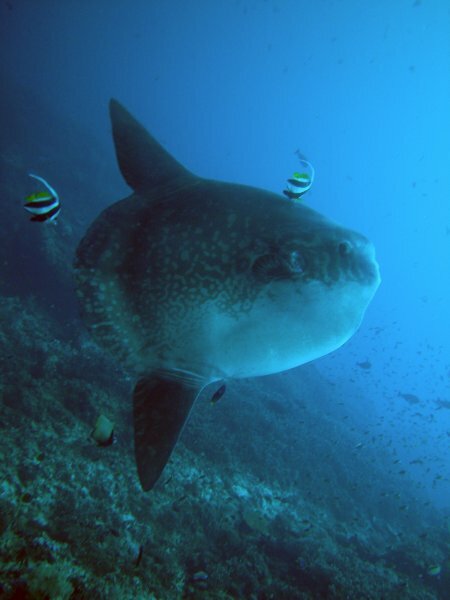 In Bali the Mola Mola come relatively close to the reef to certain cleaning stations where groups of the bannerfish (Heniochus diphreutes) literally "attack" them, eating the parasites that infest their skin. 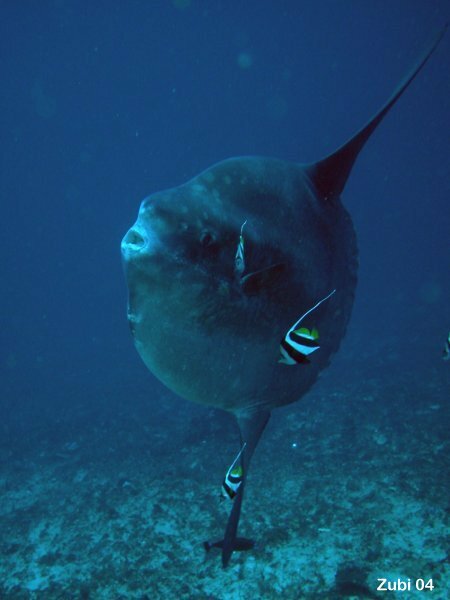 If a sunfish comes even closer to the reef, angelfishes and sometimes other butterflyfishes also go after the parasites. 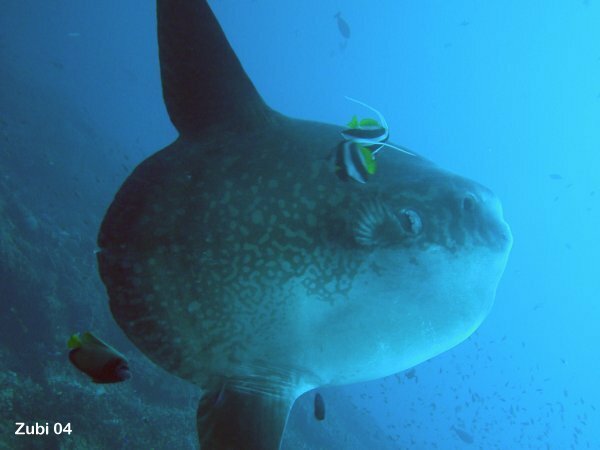 Names: sunfish (English), Mondfisch (German for moonfish) Manbow or Manbo (Japan), Poisson lune (France), Putol (Philippines - Visaya for "cut off"), Toppled car fish (Taiwan), Bezador or Pez luna (Spain), Makua (Hawaii).